On Tuesday, 14 November 2017, Albanian Internet Service Providers gathered in central Tirana for the first Albanian Network Operators Forum (ALNOF). The event was organized by RASH, the Albanian Academic Network, and NaMeX, the Internet Exchange Point based in Rome, Italy, with the goal of bringing Albanian ISPs together to discuss their common issues. The Internet Society sponsored the event. The main topics on the agenda were Interconnection and Networking Community. Albania is one of the only countries in Europe that doesn’t have a neutral Internet Exchange Point: Internet traffic from one Albanian ISP to another sometimes crosses many borders and reaches Amsterdam, London, or Copenhagen before returning to Albania. RASH and NaMeX presented their partnership to create ANIX, the first neutral Internet Exchange Point in Albania, and MIXP presented its experience of the Internet Exchange Point in Montenegro. The session was completed by presentations on PeeringDB, the Facebook network, and IPv6. As for the Networking Community topic, Albania is a small country where many people running network infrastructure operations know each other, but there is no actual “community” of ISPs. This session included presentations by two organizations that are committed to develop networking communities: RIPE NCC and the Internet Society. Jan Žorž, ISOC Operational Engagement Programme Manager, spoke about the experience of NOGs around the world and in particular of the Slovenian NOG (SINOG). 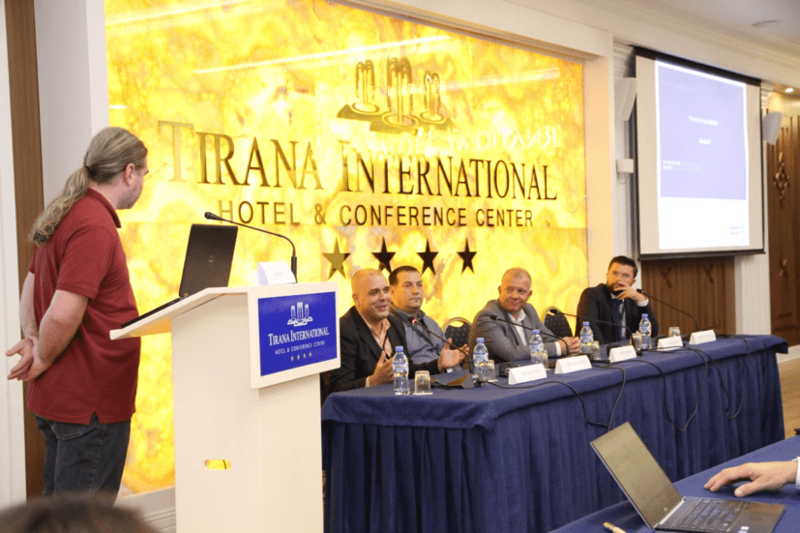 Jan’s presentation served as introduction for a panel of Albanian network operators, who discussed whether it would make sense to start an organized Network Operators Group (NOG). There was enthusiasm among ISPs from Kosovo and Albania present in the room when asked who would participate in an Albanian NOG, and at lunch, immediately after the event, a first informal meeting took place of what would soon become the steering committee of ALNOG. The same evening there was a new meeting over dinner, and ALNOG now exists, for the moment in the form of a website and a mailing list. ALNOF was the opportunity for giving birth to a network operators’ community in Albania and a thriving interconnection environment for Albanian ISPs. Let’s keep supporting them with the international community! Hurray for the Internet in Asia-Pacific!